Do you feel like you have so much to do that you don’t know where to start? Everything that requires your attention seems like a priority? We are going to show you how to prioritize your tasks and eliminate the ensuing chaos. First, list everything that needs to be done. Then, decide about three aspects of each task. Consider the value of each completed task in terms of the impact on the other tasks on your list. Answer a question: “If I do not complete these tasks, what will happen?” Take into account the positive results of accomplishing certain tasks on your list. What kind of benefit will it bring you? Mark the effort required for each task. Consider the time and resources needed to complete each task. Consider an upcoming deadline. Decide which of the items on your list must be done today, this week, this month or even this year. Create a table (as you can see in the picture below). 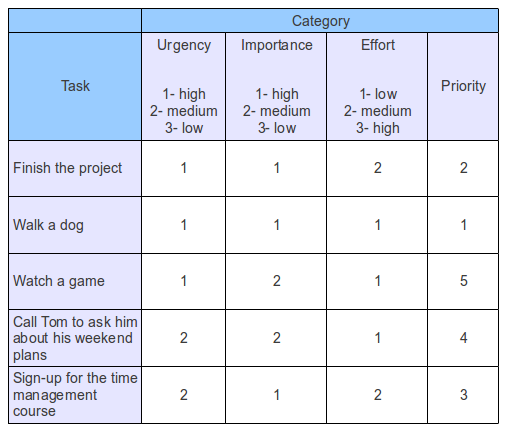 Rate each task in terms of importance, effort and urgency. Group the tasks with the highest importance and least amount of effort. Decide which ones need to be done first based upon upcoming deadlines. Tasks of low importance and urgency can be deferred. How do you deal with prioritizing? Do you know any other methods you would like to share with us?